Many of the ancient myths were created around a bunch of deities, not just one. Most pantheons had gods of the skies, the seas, the harvest, love, war… you name it. The pantheons were rich and people prayed to gods that could guide them in their еveryday tasks – fishermen worshipped gods of the seas, smiths revered the gods of the forge, soldiers honored the gods of the war and so on and so forth. A god for every craft, for every personality. This is why we sure cannot limit the leaders of each Mythology to be just… one. Let’s say you’re a fierce Viking warrior. Let’s say you went to battle. Let’s say… you died. You were slain in battle. Your soul lingers through the endless void, carried by the cosmic stream, ready to enter the Great Hall. But the gates of Valhalla are closed. And now what? Fret not! For the Goddess of Love is here to take you to a special place. Freyja was associated with love, beauty, fertility, sorcery, war, and death in the Nordic myths and she is the first alternative leader in the Norse Mythology in the War of Myths. Freyja is the ruler of the heavenly field Fólkvangr, to where she guides the souls of half of those that die in battle, whereas the other half go to Valhalla. 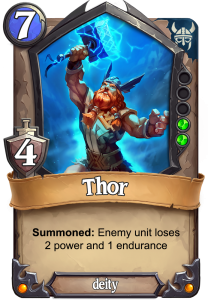 Freya is kind to the side that brings more powerful souls at her side so she will reward you for any strong creature that you lose and send to her great hall, Sessrúmnir. 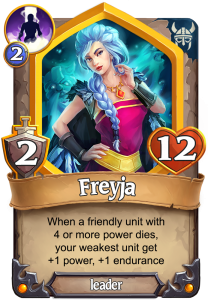 Choosing Freyja as your leader will empower your smaller creatures each time you lose a more powerful one. 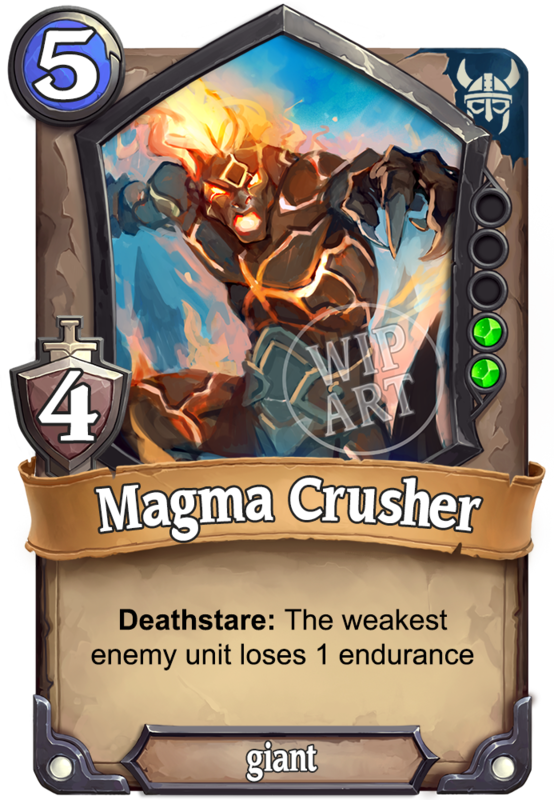 That way you can attack with strong creatures without dismay – yes, you may lose them due to exhaustion or treacherous curses, but their power will partially remain within your army. 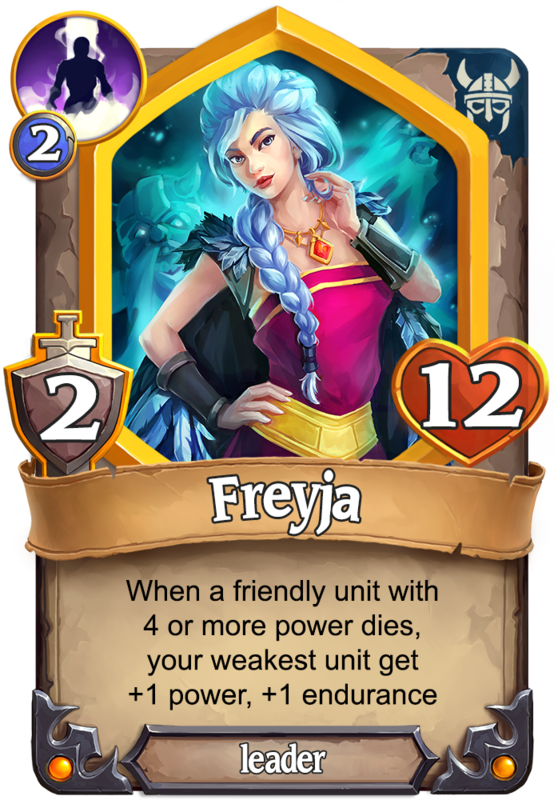 You can summon mighty units, such as Thor or Magma Crusher who can dominate the battlefield with their strength, and even after losing them Freyja’s favor will keep your army strong. You greet the sunrise and check your equipment. Your katana is sharp as ever, your wakizashi and tanto are in place. You put your armor and your helmet on, you burn a stick of incense and whisper a silent prayer to Hachiman. You step out and meet with your fellow Samurai and you get ready for the next battle. Glorified by all samurai warriors, Hachiman is the Japanese god of archery and war. 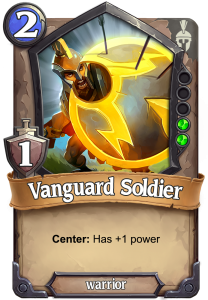 Under his guidance, you can prove how honorable you are in a fight by beating all odds and enter a battle with a single unit and win it. The tutelary god of Japanese warriors will support your aggressive approach, making your attacks with a single unit even more devastating, while keeping the rest of your creatures ready to defend your temples. 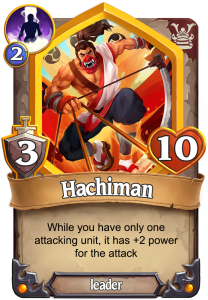 With Hachiman’s combat ability, all creatures within your ranks can be formidable solo attackers. 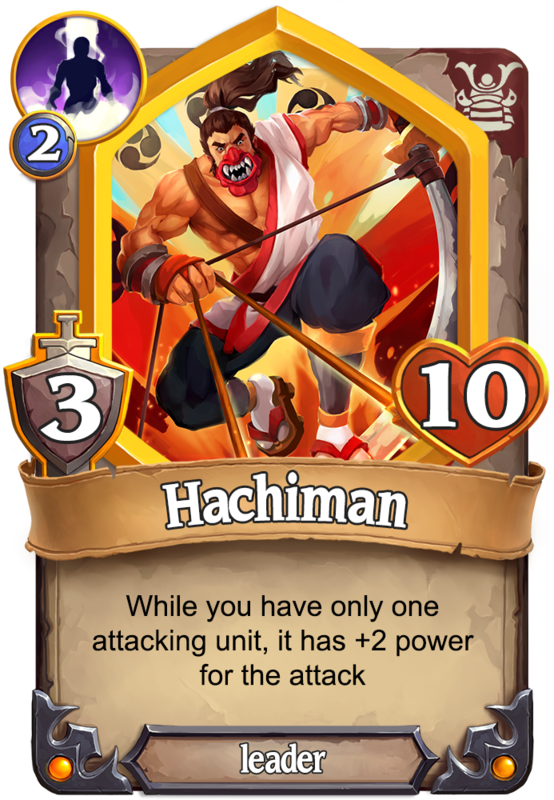 However, some of your units can be especially deadly with the guidance of Hachiman. 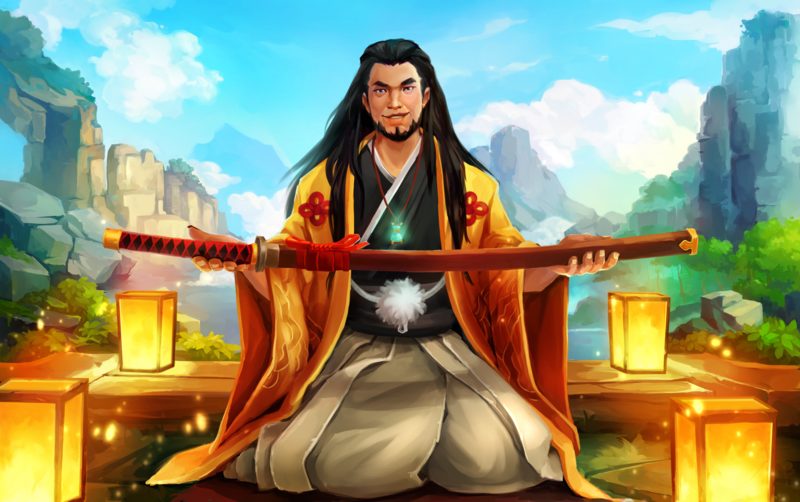 Such units have another skill unique to the Japanese mythology – Bushido. Units with Bushido receive various bonuses while attacking alone. 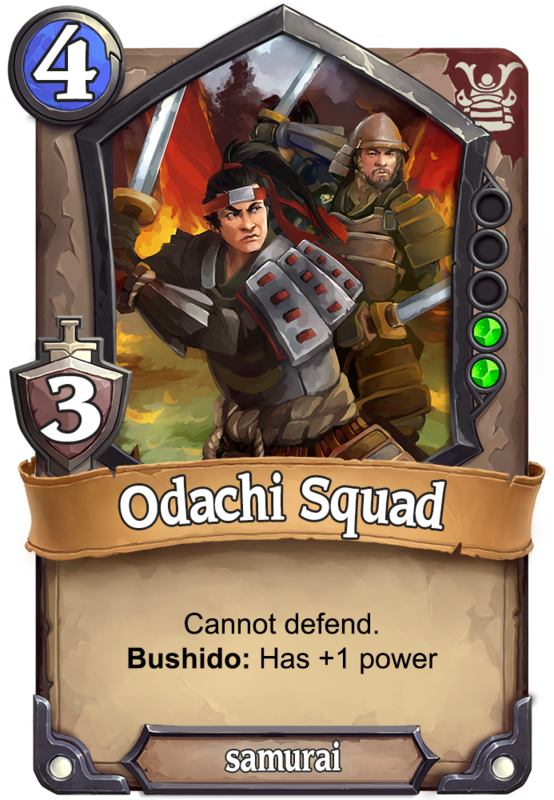 A good example is the Odachi Squad – unable to participate in the defense, but the warriors in the squad are very well coordinated while in the offense and especially when no one gets in the way. 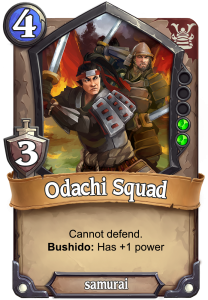 With the help of Hachiman, the Odachi Squad can wreck the enemy lines and clear the way to the opponent’s temples. Furthermore, your weaker units can contribute to your cause, by giving their life and their honor to the greater goal. 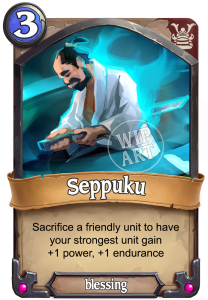 By committing Seppuku, their life force can strengthen your champions and provide them with extra stamina for the fight. 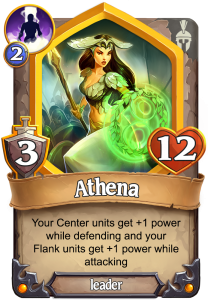 Born from the most remarkable headache in all myth and legend, Athena was worshipped as the Goddess of wisdom, knowledge, and warfare. 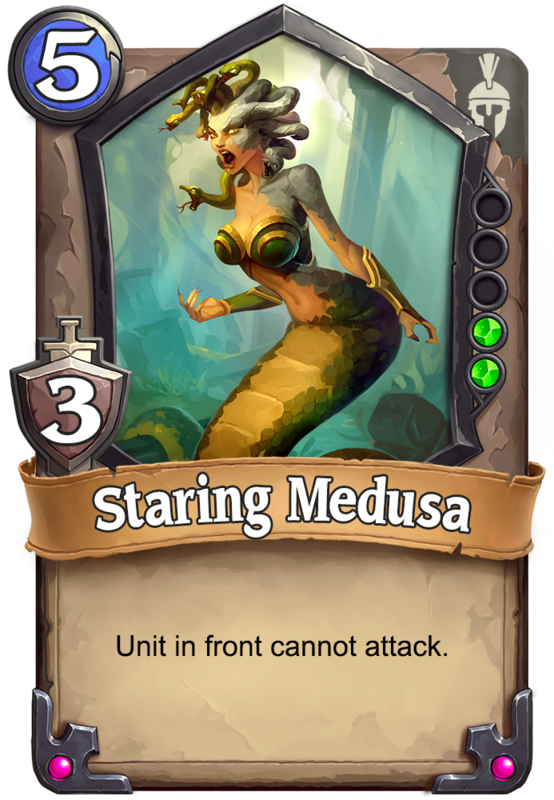 She assisted many legendary heroes during their quests – she guided Odysseus back home, helped Theseus survive the Labyrinth, told Perseus how to cheat Medusa and even hinted at Bellerophon how to capture Pegasus. They all had something in common to earn Athena’s aid – they were all proven and dignified warriors. If you show war prowess and discipline, she will stand strong at your side. In World of Myths, the way to do this is to arrange your units in an optimal way, so that they take the most effective battle formation – something common for the Greek warriors. 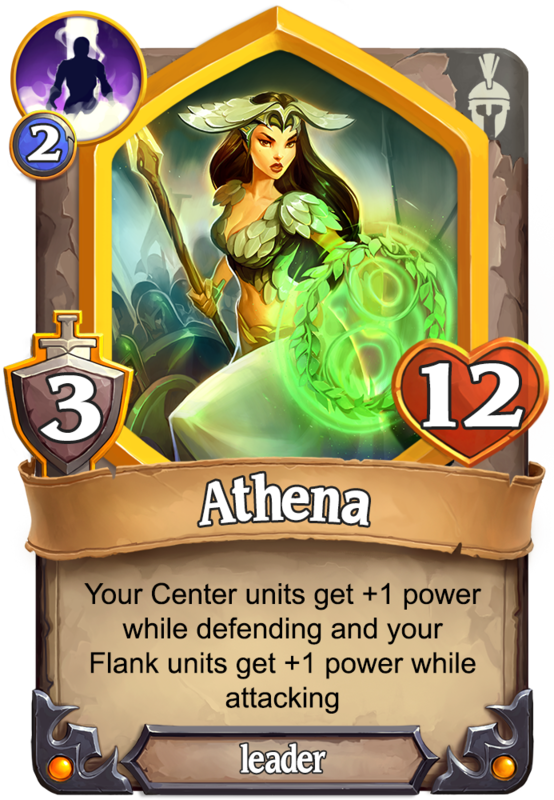 Regarding how it would be best to place your units to use Athena’s combat ability, it’s up to you. However, any units that have the Center or Flank ability fit really well in a compact and organized battle formation. 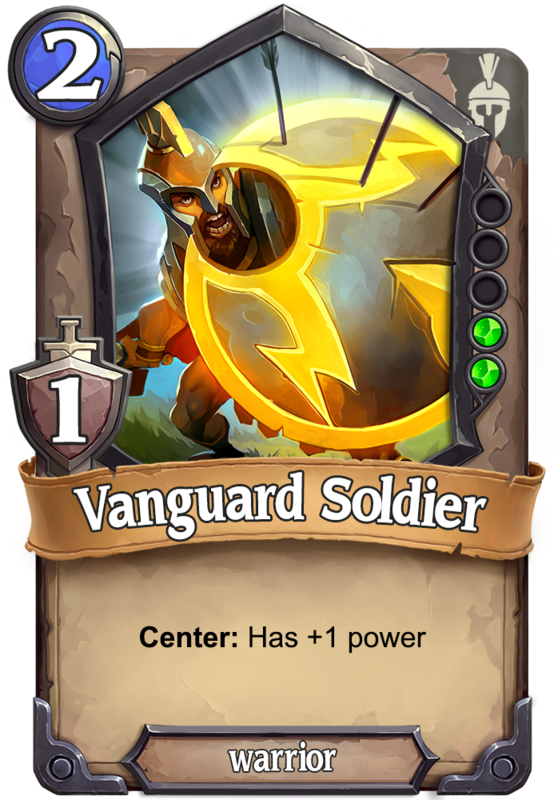 Including units like the Vanguard Soldier in your deck will give you that extra bonus needed to create the strongest and most unbreakable battle formation your opponents have ever seen. 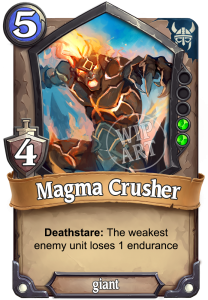 You will also have the opportunity to distort the opponent’s unit placement by using creatures with powerful positional abilities. 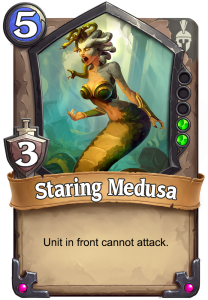 One such creature is the Staring Medusa, who will petrify the unit in front of her with a single glance. As you might guess those will not be the only leaders available for each Mythology. 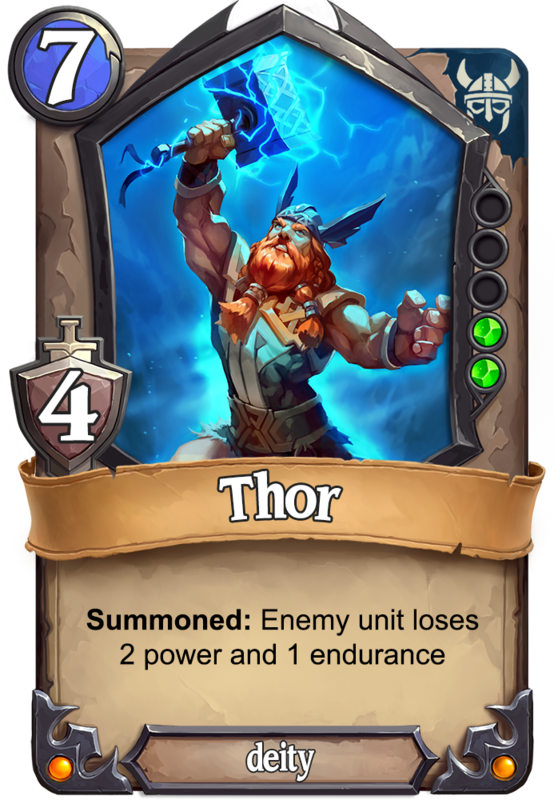 Later on, we will include even more leaders on the roster, giving you the opportunity to adopt new styles of play and explore your favorite Mythology in more depth. Earn the favor of your new leaders and accept their help to catch your opponents off guard and defeat them in new and unexpected ways. However, only those proved worthy and Loyal to a Mythology will earn the favor and will be granted the blessing and the access to play with any additional leaders. As we earlier explained Loyalty will be a vital part of World of Myths. What does this mean? 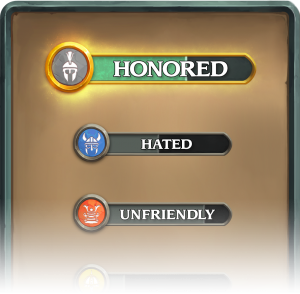 When you win a game with you favorite Mythology you will earn Reputation Points. 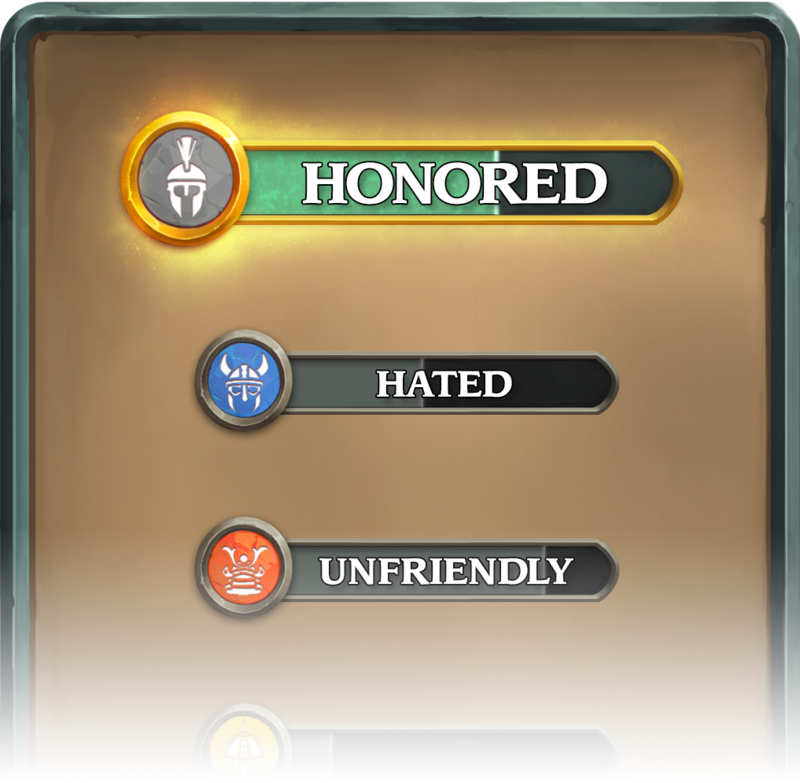 The more you play and win with that Mythology the higher Reputation you will have and the more you will prove your Loyalty. Higher Reputation ranks will unlock additional leaders from that mythology (such as Freyja, Hachiman, and Athena) as well as other benefits that are subject to another blog post. There’s just this thing though… The other factions may not like you that much. Defeating opponents will earn you negative Reputation towards their mythology. You may soon realize that by offending the foreign gods you have painted a target on your back. And who knows where that would lead…?